A team of 16 Y10 mathematicians travelled to Birmingham University to take part in ‘The Big Maths Quiz’ in February. They competed against a large number of regional schools , they scored very highly in the quiz and represented the school perfectly with excellent behaviour and great enthusiasm. 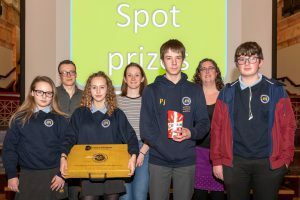 One group of four team members ( Lily Brown- Goode, Molly Eldridge, Patrick Jessop and Rufus Waghorn ) won a spot prize, some chocolates for themselves and some resources for the school. They had a brilliant day soaking up the atmosphere of the university and getting a taste of university life!